I was excited when Erik asked me to be a guest blogger, although I feel unworthy of the honor. I teach journalism, film, and writing at Susquehanna University in Pennsylvania, and I am not a scholar of Amish history and culture. I simply have a number of friends who happen to be Old Order Amish of Lancaster County, Pennsylvania, extraction. Last week, my Amish friend Rachel and I went on a thrift store shopping binge. It’s a rare day when she can get away from her six children under the age of 13, so we used the time to visit as many stores as possible to stock up on roller blades, rubber boots, baby gifts, embroidery floss, and supplies. She and her mother are avid readers of the nineteenth century author Mary J. Holmes, so we visited a used book store as well. As we passed a display case, Rachel called out. 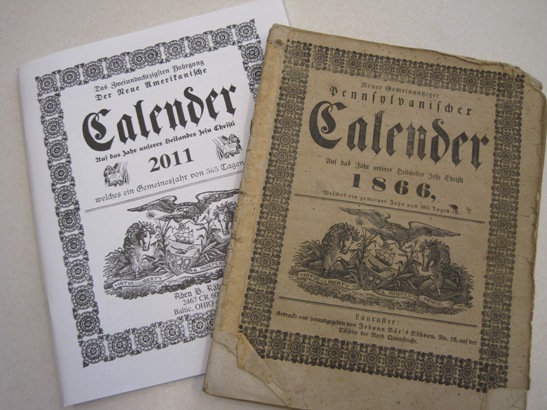 There, for sale, were eight issues of the Neuer Gemeinnutziger Pennsylvanischer Calender from the 1880s and 1890s. Both of us instantly recognized the cover as nearly identical to the Amish-produced “New American Almanac” that Erik has discussed before on this blog. As Rachel and I pressed our foreheads to the locked glass display case to examine the covers, we longed to hold the old Almanacs and turn the pages. The very next day, I went back and bought them all. Calendars play a significant part in the lives of Old Order Amish of Lancaster County heritage. Picture calendars are one of the only forms of pictorial decoration allowed on the walls of their homes. Once, in the home of a Lancaster County Amish friend who lives in a “daughter settlement” in Indiana, I realized that I could see six picture calendars from where I was sitting in the kitchen. They featured horses, barns, lighthouses, bluebirds, and wildflowers. No calendars with photos of people are permitted. One reason that the Amish value the “New American Almanac” that almost everyone calls the “Raber Almanac” is that it lists the dates for special holy days that are not found on ordinary calendars. For instance, Pentecost is observed in the Old Order Amish world, and Lancaster County Amish also reserve the day after Pentecost for visiting. Known as Pinksta Monday, the holiday closes many Amish businesses for the day. The Raber Almanac also lists other important holy days for the Amish, such as Ascension Day. A sacred and important holiday for the Amish is Oct. 11 , or “fall fast day,” each year, and English customers will also find businesses closed that day. If Oct. 11 falls on a Sunday, the holiday is observed the day before. The holiday has its roots in the Feast of St. Michael, also known as Michaelmas. While the Catholic Church observes this holiday on September 29, the Amish did not adjust the date when the Julian calendar was replaced by the Gregorian calendar, and thus their holiday is Oct. 11. Another benefit of the Raber Almanac is that it lists when services will be held in each church district. All Old Order Amish church services (gemeinde, pronounced ge-MAY and abbreviated “gmay”) are held every other week. They either meet on an A schedule or a B schedule, so that you can look up the Rebersburg district of Centre County, PA, and see that gmay will be held on B Sundays. Whose house will host gmay, however, is announced in one of the “gemeinde brief” (church newsletters) publications that are published by the various settlements. The Raber Almanac also includes ads, inspirational short articles, astronomical events, the scripture to be covered in church, and 60 pages of ministers’ names, birth years, addresses, and dates of ordination. This listing of Amish church districts and their ministers is not found anywhere else in Amish literature, so it’s another big selling point for the Raber Almanac, which, by the way, can be purchased in either German (not Deitsch) or English. Because my German is scanty and slow, I bought the English language almanac once to use for help in translation, but I found that the text is quite different. There are no shortcuts to anyplace worth going, I suppose. The Raber Almanac continues the tradition of publishing the dates of holidays that pretty much nobody observes any more. For instance, the Ember Days are noted on the inside front cover of the 2011 almanac and on page two of an 1881 edition. This morning I asked an Amish historian, a German-born Catholic, and a medieval historian if they had ever heard of Ember Days. Only the latter had heard the term, but no one could say what they were. Finally, the old Pennsylvania almanacs that I bought turn out to have been the product of an amazingly prolific nineteenth century entrepreneur named John Baer or Johann Bär (1797-1858), a printer in downtown Lancaster. Baer began his English-language “Agricultural Almanac” in 1825, and it’s still printed in Lancaster County today. The German language almanac was started in 1831, was going strong up until the first World War, and was purchased and revived by J.A. Raber in 1930. So after almost 100 years in English hands, the New American Almanac, still featuring a stylized crest of the state of Pennsylvania on its cover, has flourished in Amish hands for more than 80 years. Awesome story, very interesting information!! Thanks so much for sharing, I really enjoyed reading it. I loved to hear about the spiritual holidays that are listed in the almanac. That is pretty cool. I don’t think you find those listed anywhere else. I live near Parke County, Indiana, and I purchased Raber’s Almanac at an Amish variety store there. I have enjoyed reading through the almanac. Excellent post! For those who want an explanation on the Ember Days, I suggest you google the Catholic Encyclopedia online with the term “Ember Days” for the definition and praxis. Ember Days were days of fast and/or abstinence peculiar to the Roman Catholic Church that occurred during certain seasons and prior to important feast days. The practice of ember days ended following the Second Vatican Council with the promulgation of the New Mass of Pope Paul VI and the new calendar. However, there are still some “Traditional” Roman Catholics who attend the older Latin Mass who observe the tradition of the ember days out of personal piety or at the request/requirement of their priest (these being Roman Catholics who have not recognized any of the Pope’s since the 1950’s as legitimate successors to the Papacy). I found it interesting when opening up Raber’s Calendar the first time that each day lists a Roman Catholic saint. Who knew the Amish were so ecumenical? Seriously, though, it is a startling irony that the Amish would acknowledge the canonized saints of a church which tortured them during their time in Europe. Thanks for the excellent article, Kate. Here in Lancaster County, PA, vintage picture calendars command high prices at Amish household auctions because Amish bidders compete for them like fine art objects. It is often the Amish men who bid on these colorful calendars, so the antique calendars with hunting scenes or wildlife images often sell for big bucks. So if you have a 1920s calendar published by Winchester Rifle Company, sell it to an Amishman. It will make him very happy! Hopefully, Kate can shed more light on this puzzle! Wow, this brings back memories from my childhood. My parents always bought a Raber’s Almanac in a Spector’s Drygoods store either in English or German. Mom used it to determine when to plant ground crops or flowers or cucumbers. And if she didn’t plant on those days we didn’t get much of a crop. Of course I studied that thing mostly about the preachers and counted all the church districts across America and into Canada. Even the Hutterite preachers were listed, although at that time I had no clue who the Hutterites were. I talked to three Amish friends specifically about the saints’ days, and not one had paid the slightist attention to them. One did not know that the names on each day were saints’ names. 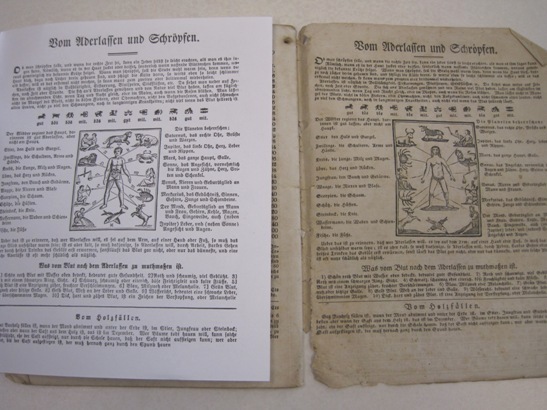 I have looked at nineteenth century almanacs in German from three other communities–Allentown, Pa., Reading, Pa., and Cincinnati, Ohio. The pages listing astronomical information and saints’ days are identical in format from one place to another. It is almost a template that is only changed to reflect precise sunrise, sunset, moonrise, etc. times in each longitude. Lee, you’re our printing historian. Was there a mat or a template? Katie, I had read that there used to be Hutterite listings, but I have not seen any in the past 10 years or so. Thank you, Alice Aber and James, for your kind words. Hello everyone God bless all of you today. I can sence the bond we all have. Our love for the Amish is only because of Christ in us. For he is the waymaker and the one that brings Gods people into fellowship in his light (word). We are family and kin this morning, thank God for the fellowship of the saints. I draw close to the Amish because I cannot find it in the Church. We live in a day of darkness and deception. But God has a people. My life and the way I live are very like the Amish. I am very dedicated to Christ. It really touched my heart when this beautiful educated lady said they like the old New “American Almanac” because of the Holy Days. That are not availible in ordanary calenders. It is the way I feel. They for the most part pant after that which is of God. And not the World. It makes my heart Smile. The educated lady must be very respectfull of the ways of the people. It is difficult to hang with people in the World without the World rubbing off. I wonder how that affects the Amish. I am Amish in Spirit even though not in the Flesh. God Bless you brothers and sisters. I LOVR YOU! the New American Almanac, still featuring a stylized crest of the state of Pennsylvania on its cover, has flourished in Amish hands for more than 80 years. As the sub-title of the DVD states…the Amish truly are a people of preservation. I admire them for that. Anglicans still keep Ember Days. The Lenten Ember days _ Wednesday, Friday and Saturday – fell this week. We are tokeep them in church services and personally as fast days. When I was a seminarian, we were to write our bishops in Ember weeks. (The other Ember days fall after WhitSunday, or Pentecost.) They are days for “fanning the embers of faith into flame.” (Evelyn Underhill, I believe.) We keep Pentecost (Whitsunday) and Ascension Day, as well. The saints’ names may have been retained for parents, as a guide for naming children born on or near that day. I have a theory that the Amish were isolated Orthodox who lost their Constantinople-associated bishops at the Great Schism. They were too isolated for Rome to bother with until the Reformation, when they became involved with the Anabaptist movement. What is a daughter settlement? Many Amish settlements consider themselves to be “daughter settlements” of Lancaster County PA. The Amish who settled in southeastern PA, be it Chester County, Berks County, or Lancaster County, in the 1720s-1790s ended up in fairly compact settlements in Lancaster County for five or more generations. In the past 50 years, their numbers became so great that there was not enough farmland for them in Lancaster County. They formed settlements in other Pennsylvania counties, Virginia, Maryland, Kentucky, New York, Wisconsin, Indiana, and Missouri. 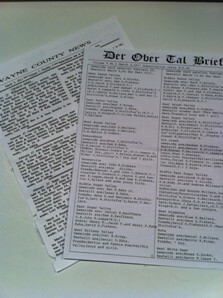 In 2008, a directory was printed of the addresses of the Lancaster County Amish. There are 6,639 entries spread through eight states. It is so very neat what one can find while shopping when they least expect it. It is the sort of things certain antique themed TV shows are built around. My reproduction almanac that I mentioned once seems to be bound similarly, only the artist used string “to be more authentic to the way they bound them in the era” though I notice the 1866 one illustrated may be stapled, but it could have been the way it was done. PS, I wanted to thank Kate Hastings for her wonderful article about her discovery of these calendars, I wish I could find things like that! Oh, and does she blog on her own site? me buy a copy, but they were very gracious. 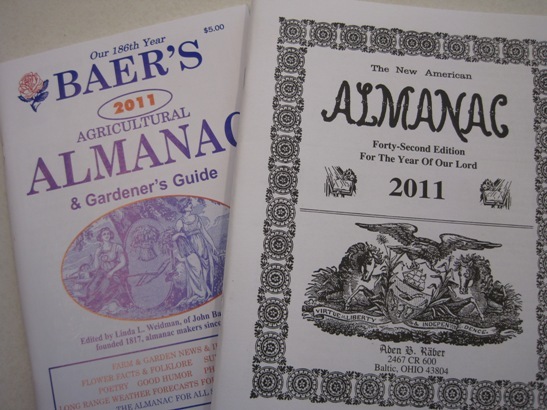 Raber’s Almanac has been a very helpful resource in visiting Amish communities that are new to me.